"Nobody is listening to your phone calls." "You can't have 100% security and then also have 100% privacy and zero inconvenience. We're going to have to make some choices." 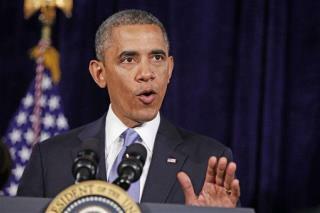 Obama also criticized the leaks that have led to the recent spate of stories. "There's a reason why these programs are classified." Waiting for the day when we throw all these clowns out of office and exile them to the ocean. Sure, just like the IRS didn't really audit GOP groups. More scumbag politics as usual. Dump both parties, term limits for all ! !